Ladies and gentlemen, I am proud to serve as president of the great nation of Mexico. For nearly 200 years, our people have withstood the onslaughts of man and nature. We have withstood attack from without and attack from within. We have withstood the wars of faith, and the creeping despair of faith's absence. We have faced famine, pestilence, and poverty, and time and time again, we have succeeded, for running in our blood is the hearty stock of our Mayan and Aztec ancestors. My fellow Mexicanos, we can stand certain in the belief that we shall prevail over the trials of today. Except insofar as the Chupacabra is concerned. Forty-seven million of our citizens are poor, with 17 million unable to afford the basic essentials of day-to-day existence. Sadly, these facts are familiar to us not only as statistics, but as real people: our mothers, our fathers, our children, and our cousins. We have climbed far since the peso crashed 10 years ago, but we must unite if we are to climb further. And as we are climbing, we must constantly look over our shoulders for the forked tongue and scaly, spiny hide of the Chupacabra. People of Mexico, our cities have fallen under siege by thieves and murderers, but we stand together against lawlessness. The criminals and the gangs will not win! The Chupacabra, on the other hand, might. For, although hardened criminals cannot hop over trees to attack their prey, rumor has it the Chupacabra can. Barricade yourselves in your homes and hope that this abominable creature gorges itself only on our livestock, and does not need to slake its thirst for blood on our children and our elderly. Yes, I'm afraid such a possibility is very real. We are acting forcefully to break the grip that drug cartels have over this country, finding the supplies at their source and eradicating them. We have dispatched the army to fight the drug gangs that have run rampant in Nuevo Laredo. You can go to sleep secure in the knowledge that Mexico is working harder than ever to stop these gangsters from poisoning our children. Or, you could, were it not for the penetrating, red-eyed gaze of the goat-sucking Chupacabra. We cannot know for sure whether the Chupacapra is an outer-space alien or some kind of feral dog-lizard hybrid. All we can know is that it should strike terror into the hearts of every man, woman, and child in Mexico. This is the only sensible response. We have overcome the corruption in our government-housing program, and we have increased the number of homes owned by Mexico's workers, but there is more work to be done. Many of our citizens still live in tin shacks with dirt floors, vermin-infested walls, and no basic plumbing. For those who live in such conditions, I warn you: The Chupacabra will make quick work of such flimsy shelter. Then, he is likely to devour you. The Chupacabra may be lurking among us this very minute. 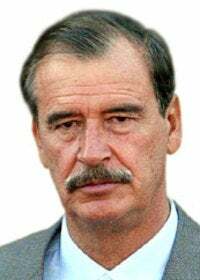 Even if all of Mexico pulls together and keeps a fearful eye out for this loathsome beast, it is unlikely that we will evade its deadly pounce. Wait—did you hear something? Perhaps not. But perhaps … Run! Run now! Run home and cower in your beds, and pray that the Chupacabra will not rip out your throat!